This black tea is grown in the Kisii Hills of Western Kenya and is hand-picked, bud & two leaves. This tea is then produced in the CTC (cut, tear, curl) style. 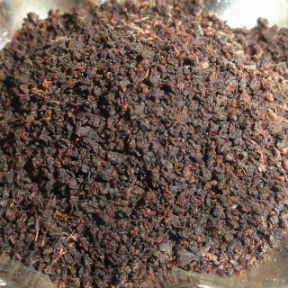 The result looks like small, even pellets that steeps quickly into a full-bodied, smooth black tea. Enjoy on its own or with milk and sugar. This award-winning tea is from the Ajiri Tea company. Ajiri Tea Creates jobs for the women of Western Kenya: 100% of the profits from sales are then donated to the Ajiri Foundation for education of the orphans in this area. Also available are boxed teabags for gift giving. 16 teabags to a box with a label designed and handcrafted by the women. No two are identical.